Background: New psychoactive substances (NPS) are a heterogenic group of substances with different chemical structures and psychotropic effects. Method: Many pharmacotoxicological laboratories performing drug testing in conventional and nonconventional biological matrices for clinical and forensic purposes do not include screening procedures for NPS in their routine protocols. This is mainly due to the continued entry in the market of newly synthesized products, the low availability of reference standards, in particular of their metabolites, the low availability of immunochemical kits, etc. Moreover, many of the new compounds are very potent, and low doses ingested will lead to low concentrations in biological matrices, especially in hair. Results: Hair analysis has become a powerful tool for detecting chronic drug use and has become a routine technique in forensic toxicology laboratories. Conclusion: The aim of this study was to set up analytical strategies to identify repeated consumption of NPS by hair analysis. Although UHPLC-MS/MS may represent the elective technique in studying NPS, a combination of both GC-MS and UHPLC-MS/MS techniques is useful in creating a complete toxicological image. 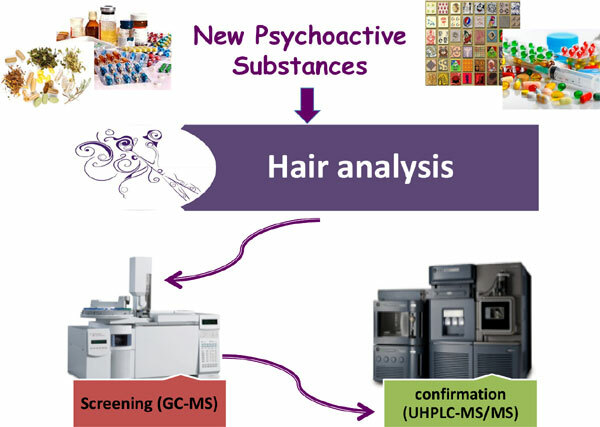 Keywords: New psychoactive substances, Hair analysis, Gas chromatography-mass spectrometry (GC-MS), Ultra-high performance liquid chromatography-tandem mass spectrometry (UHPLC-MS/MS). Keywords:New psychoactive substances, Hair analysis, Gas chromatography-mass spectrometry (GC-MS), Ultra-high performance liquid chromatography-tandem mass spectrometry (UHPLC-MS/MS). Abstract:Background: New psychoactive substances (NPS) are a heterogenic group of substances with different chemical structures and psychotropic effects.